Discussion in 'POTW Collaboration' started by Serebii, Aug 19, 2018. This is a standard Doubles (OU) set for Mega Metagross. Clear Body is the preferred ability as it avoids being lowered by the common Intimidate before mega evolving. Iron Head is usually chosen over Meteor Mash due to its more reliable accuracy (Trust me on that, Meteor Mash have missed multiple times before) with a decent chance of causing flinch. Ice Punch provides fantastic coverage for Mega Metagross. Zen Headbutt is more powerful as Metagross gains STAB from it, but its coverage is fairly undesirable outside of hitting Mega Gengar. So Zen Headbutt is best served with Tapu Lele as its teammate. Stomping Tantrum is chosen over Earthquake as the former gets the Tough Claws boost while the latter would have its power reduced by 25% when targetting multiple Pokemon. Only pick Ice Punch for the third slot if Zen Headbutt was included. An alternative option would be Thunder Punch in conjuction with Tapu Koko. Just give it some good offensive moves. There, your done. That's Metagross for ya. Iron Head is chosen over Meteor Mash due to its more reliable accuracy (Trust me on that, Meteor Mash have missed multiple times before) with a decent chance of causing flinch. I'd still recommend at least slashing Meteor Mash with Iron Head. The drop in accuracy comes with a bit of extra power that's always appreciated, and while it is up to chance, Meteor Mash's 20% odds of raising your Attack one stage can make Mega Metagross nigh unstoppable, frequently scoring quicker KOs. As an example, I once secured a win only thanks to a +1 Zen Headbutt against an opposing Mega Charizard Y. 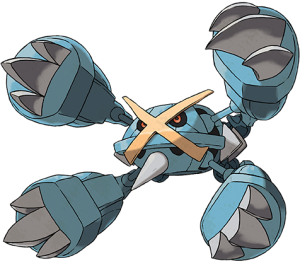 Tank Metagross. This has the main benefit of drawing in and eliminating the Bulky Waters (not named Swampert) that otherwise wall it to Arceus and back (lest Metagross is running Trick, Grass Knot or Explosion, which is why this is a gimmick set). Toxic to drain away health + RestTalk for Longevity. Last move is up to preference. 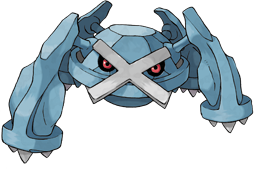 Meteor Mash prevents Metagross from being Taunt bait, hits hard thanks to Metagross' impressive Base ATK and with a luck, can be a setup move for our X Tank. Block prevents opponents from running before they learn your game plan. Zen Headbutt is a good STAB for wearing down Water types faster. This set has its problems. Foes that Metagross could normally beat now walk all over it. Dark and Ground types hit way too hard for this strategy to be effective against them (though the defensive Ground types like Hippowodon and Gastrodon dislike eating a Toxic). All this on top of the fact that Metagross becomes setup bait for everything else. Air Balloon + Grass Knot -Earthquake is everywhere: get your own rubber balloon today and you too can avoid Earthquakes. I'll even throw in a little Grass Know for taking down the STAB users of Earthquake extremely quickly. Assault Vest -Metagross is a decent user of Assault Vest, but lack of recovery and a reliable setup move hurts a lot. Gravity -Because using Earthquake on Celesteela and Skarmory is fun. Mega Charizard Y and Moltress too for that matter, but you should really be running from those if you don't have any speed boosts.